In this book professional crafter Meg Mateo Ilasco offers a step-by-step guide to everything from developing products and naming the company to writing a business plan, applying for licenses, and paying taxes. Reader Kitty Kellie OF Lynnwood, WA says,"I purchased this book over Thanksgiving and just now got around to reading it. WOW! I wish I had done it sooner! I agree with all of the previous comments. 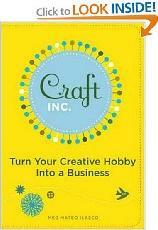 This book is a quick read with much to offer the new crafter in the way of marketing and getting organized. "Taking advantage of the internet is a must for anyone in business these days and Craft Inc. has some wonderful gems to offer in that regard which I am putting to use as I write this. The information is laid out in a non-intimidating way that lets you decide which methods are going to be best for you. "I am inspired by the interviews with successful crafters of various mediums and how they got their start! "If you are thinking about taking your hobby to the next level, this is a good place to begin your journey and you will not be sorry you purchased this book." A reader from Arkansas says,"This book is an amazing tool. I am currently in the process of starting my own crafting business and this book is the best "guide" I have seen out there. Practical tips, great advise and interesting interview make it a wonderful book. If you plan to start your own business or even if you just casually sell on the internet or at craft fairs this book is a MUST HAVE!"